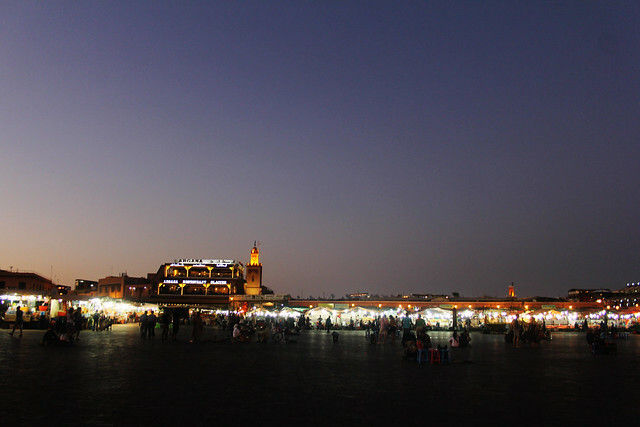 The Jemaa El-Fnaa square is the heart of Marrakech. 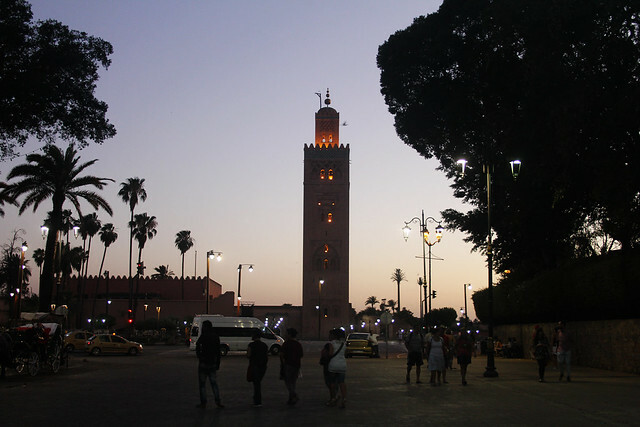 Right from the start, when I had my first look of the Red City, the first major landmark I saw was the Koutoubia Mosque in front of the square. Naturally, after we arrived, it was the first place we explored. It was about five in the afternoon and there were not many food vendors, but the place was still bustling with people buying and selling things, tourists snapping pictures, and cats lazing around under shadows. There were row after row of pedicabs, horse carriages at the park nearby, and cabs a little way further. 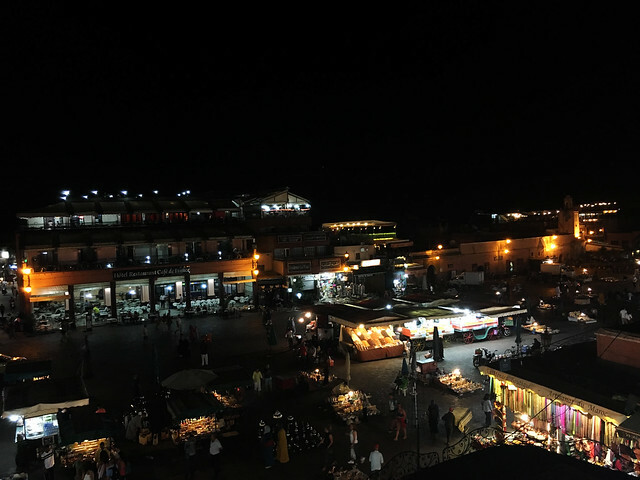 Every day we would visit the Jemaa El-Fnaa square, even when we have excursions out of town. In the mornings it was sleepy, almost quiet. One or two people would be crossing the square and it was peaceful. At noon it became more crowded. 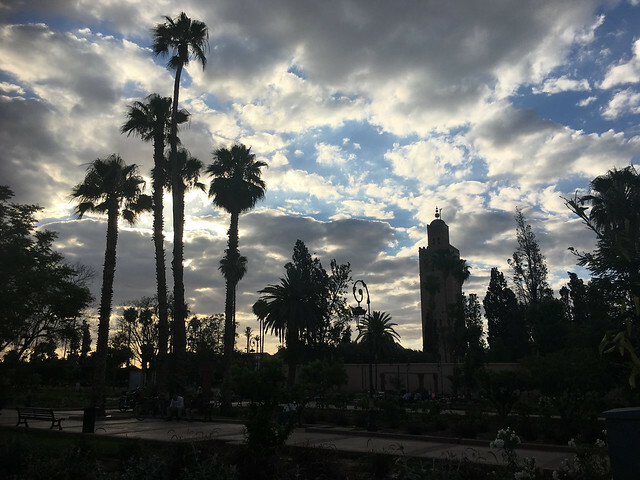 As the city woke up, so did the Jemaa El-Fnaa square. 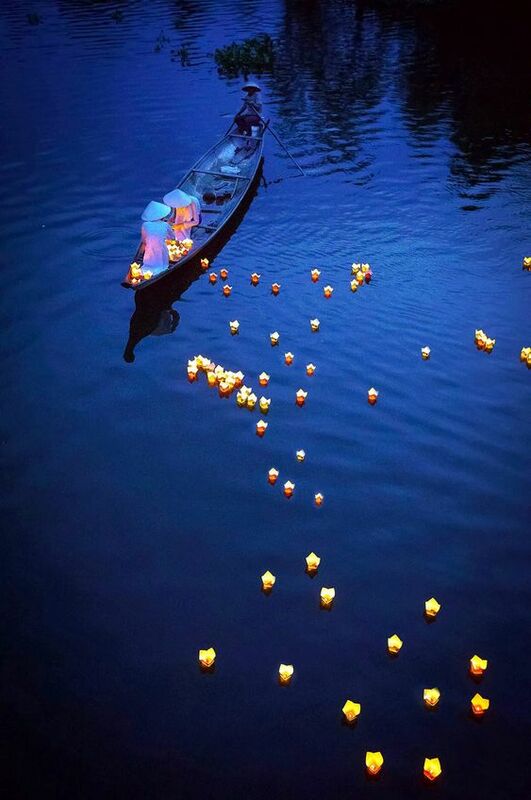 But it was at night when the place truly came alive. Perhaps it was because it was Ramadan, but the difference was considerable. Just a little before the sun set, food vendors set put their stalls. Orange juice sellers, who had been there since the afternoon, redoubled their efforts (mainly shouting) to get the attention of potential customers. Locals crowded together, ready for iftar with bottles of water and bags of food. 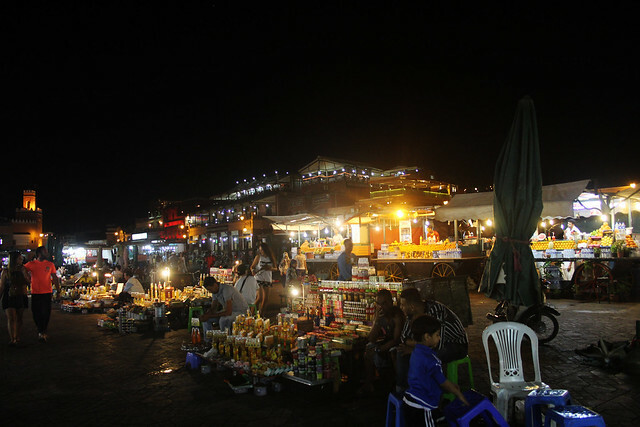 People visited each others’ stalls, sometimes bringing snacks for when the time came to break fast. Musicians played songs, the music rising above the noise of people talking, laughing, and haggling. In front of the mosque, at the park, people sat down and set their food. Tourists and children had already begun to eat. And when it was time to break fast, everyone celebrated. The lights came on (the lamp shops were especially beautiful). More music came on, more laughter, more conversations. There was something magical about each sundown; each day was similar but unique in its own way. I knew that the next day, there would be another iftar like today, but each moment was special. And the food was amazing! 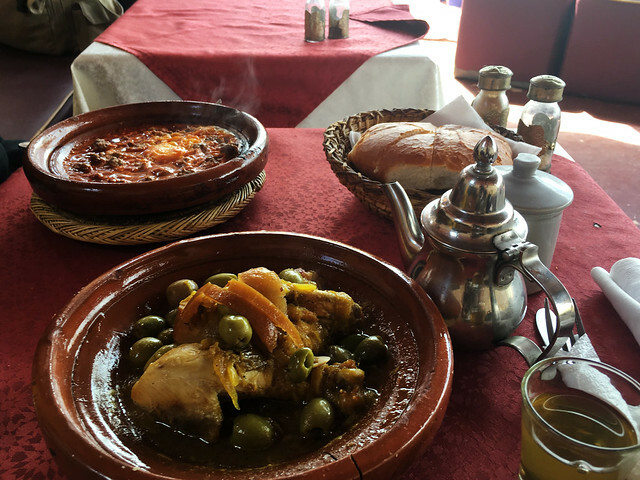 There were tajines and couscous, merguez and lamb. There were sweet desserts and pancakes with honey. There were the bread, which was a little hard and a perfect companion for everything. 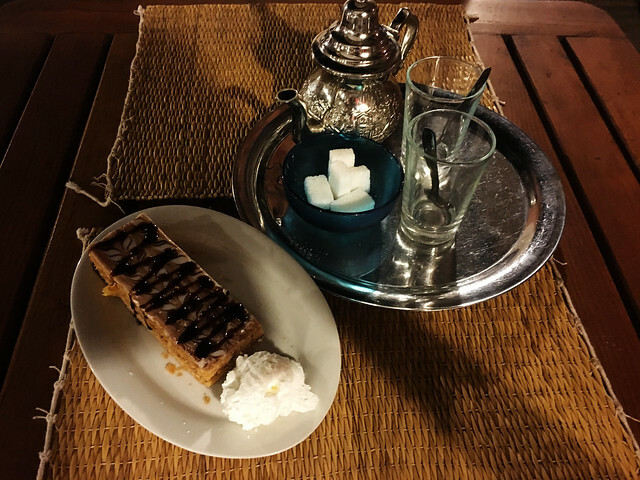 And of course, there was the mint tea. 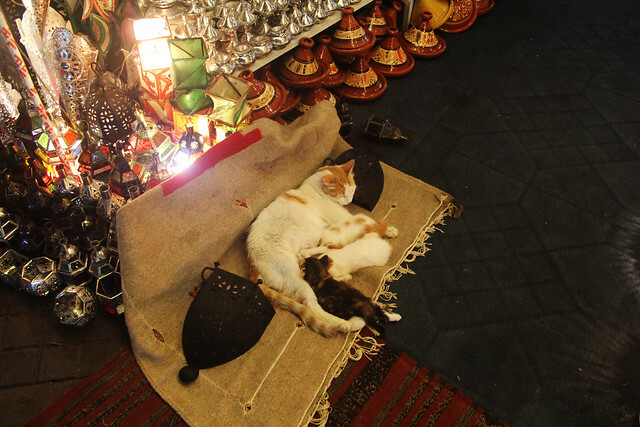 Some people had stalls in the souks, other had their products spread out on carpets at the square. Once we bought a shirt from an old man who had his entire merchandise in a large plastic bag (the shirt was of good quality, and the old man told us in broken French about how we should be careful with our bags, sometimes there were nasty people on motorcycles who would grab people’s bags). One last thing I would like to mention was how much the people we met in the square loved stories. They asked questions about where we were from, what the customs were, whether we had visited this and that. In turn, they told us their stories as well. Once, we were looking at something silver we thought was a kohl (or eyeliner) container. When the man at the shop asked, we said as much. He told us to come in, he would explain what it really was…because we didn’t want to buy anything we said, no, thank you. To my surprise, he shook his head indignantly and said that he just wanted to educate us…besides, he had time. He offered us tea, then started explaining the numerous things in his shop and outside, in the vicinity. It turned out the thing we were looking at was a perfume container. We spent about an hour inside his shop, learning about herbs, stones, Marrakech’s silverware, and the medina itself. 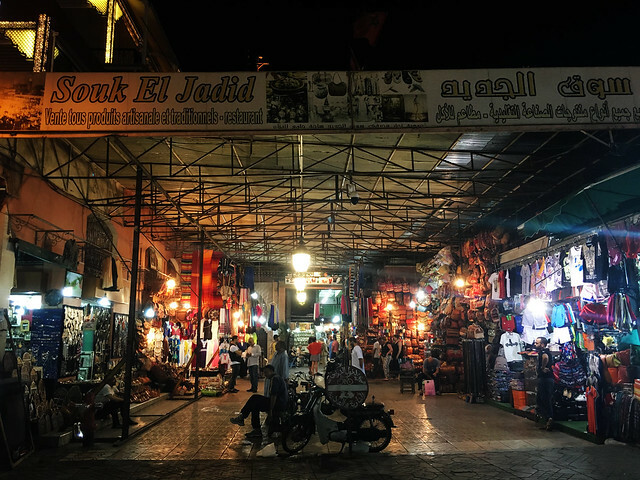 This entry was posted in Food, People and Culture, Tourist Traps and tagged backpacker, blogger, culture, el, fna, food, historical, history, is marrakech safe, jemaa, jemaa el fna, jemaa el-fnaa, koutoubia mosque, marrakech, marrakech attractions, morocco, mypassengerdiaries, on budget travel, photography, student travel, tourism, travel, traveling, wanderlust, what to do in marrakech. Bookmark the permalink.